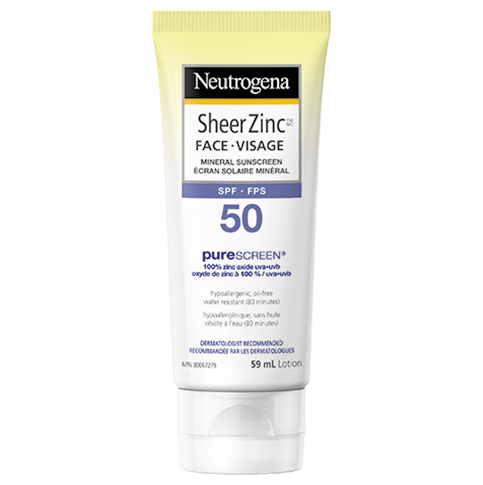 Neutrogena Sheer Zinc™ Face Mineral Sunscreen SPF 50 with Purescreen® naturally-sourced 100% zinc oxide technology. This gentle formula delivers effective broad spectrum protection against burning UVB and aging UVA rays – and if used with other sun protection measures it can decrease the risk of skin cancer and early skin aging caused by the sun. Plus, it's mild even on sensitive skin, and it's free of fragrance, parabens, phthalates, dyes, and irritating chemicals. Formulated specifically for facial skin, this product layers invisibly under make-up. Our Dry-Touch technology ensures that this sunscreen dries with a non-greasy, lightweight finish. It's also easy to apply. Non-medicinal Ingredients: Acrylates/Dimethicone Copolymer, C12-15 Alkyl Benzoate, Caprylyl Glycol, Cetyl Dimethicone, Cetyl Dimethicone/Bis-Vinyldimethicone Crosspolymer, Cetyl PEG/PPG-10/1 Dimethicone, Chlorphenesin, Chrysanthemum Parthenium (Feverfew) Flower/Leaf/Stem Juice, Colloidal Oatmeal, Dimethicone, Ethyl Methicone, Glycerin, Glyceryl Behenate, Octyldodecyl Citrate Crosspolymer, Phenethyl Alcohol, Phenoxyethanol, Phenyl Trimethicone, Polyhydroxystearic Acid, Silica, Sodium Chloride, Styrene/Acrylates Copolymer, Tocopheryl Acetate, Water (eau). Really like this sunscreen, it is the first one that I have found that I can actually use everyday without constantly getting a rash (have been using it for close to a year). I am fair skinned and find that it doesn't generally leave me looking too white (unlike a different sunscreen I have that doesn't absorb very well at all, so I end up looking very pasty). I have worn the sunscreen under makeup and haven't had any problems. I love the fact that there is no fragrance (unlike some products that say no fragrance but still have a noticeable odor, I have not noticed any odor with this sunscreen). 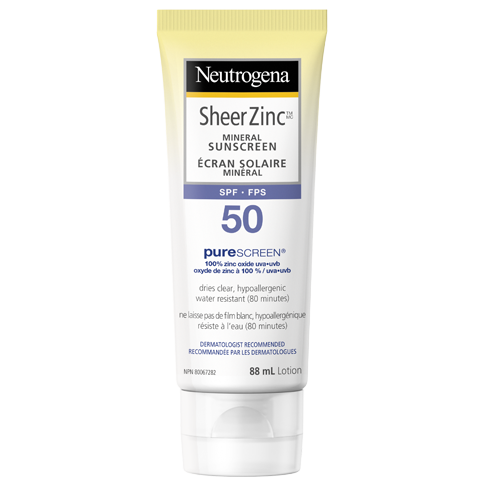 If you have sensitive skin and/or allergies, I would recommend trying the Sheer Zinc. Really hope they keep making this formula, as the other Neutrogena sunscreens do have a fragrance. The product protects against the sun. It works well as a sun block but I wouldn't recommend this for the face. I'm using mine for my body to "use it up". The product doesn't dry down, it stays sticky and greasy. This product feels and looks like diaper rash cream. I'm pretty darn pale and normally I like the white cast from a mineral sunscreen (it helps hide redness) but the sheer zinc just makes me look almost grey. Doesn't wear well with makeup. A great product idea, I love that there's no fragrance. Unfortunately, its design needs some work because there is nothing "sheer" about it. Thanks for your review! We wouldn't expect our product to be sticky or greasy, and would love to learn more about your experience. Please give us a call at 1-888-663-8876 so we can help. We're available Monday through Friday from 9am-5:30pm ET. Hope to hear from you soon! Thanks for taking the time to write a review, Joan. We'd love to chance to chat a bit more and see how we can help. Please give us a call at 1-888-663-8876 between 9am and 5:30pm ET Monday-Friday. Talk soon!